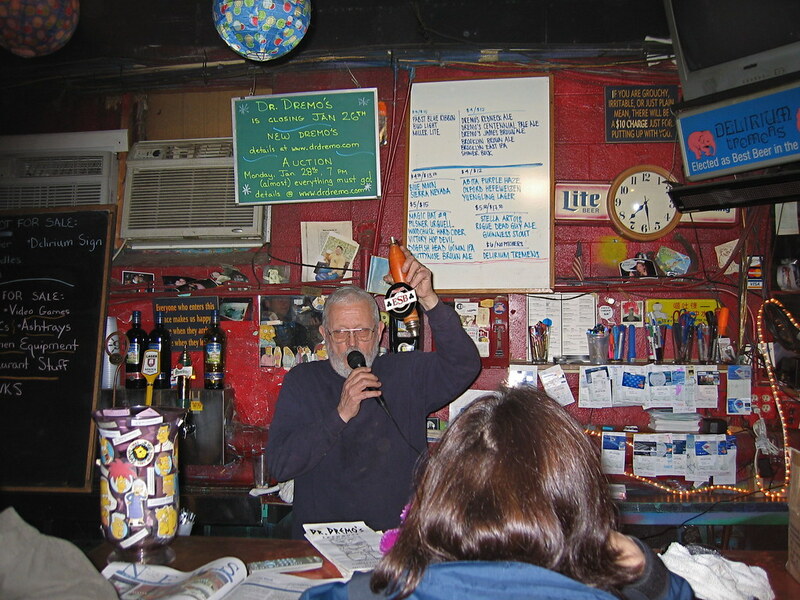 Bill Stewart auctions off one of the old Dremo’s beer taps. The final semi-public night for the place had Bill and Andrew auctioning off most anything in sight. It was a curious mix, with the majority of attendees apparent onlookers, a few serious buyers (at least a couple of people were clearly buying for other bars), and a number of folks interested in specific low-value items (that would be me). The first sale of the evening was a new Camel-branded metal ashtray for 25 cents. Notable sales included $250 for the metal silo (known as the Sin Bin, for those of us recalling the Bardo days), $15 for the (ex) parrot, and $100 (plus an unknown amount in transport costs) for the Dremo’s totem. * Ridiculous little items went, too, including a $1 paper Spaten flag, menus, etc. Surprisingly, none of the pool tables sold (if you’re willing to spend between $500-800, I suspect you could get them to part with one between now and Thursday). Much to my annoyance, a Dremo’s employee beat me out on the sole item I was interested in, but I did end up with a bit of classic Bardo art (I’ll have to take a picture and post, sometime). Greg Kitsock (WaPo beer critic, among many other things) was there and taking notes (as well as winning a Foggy Bottom poster for the princely sum of $3), so I’m sure you’ll soon be able to read more about it. *The Dremo’s totem was rescued by a long time customer who “just didn’t want to see it in the dump”, and will soon be making its appearance in his backyard (as soon as he figures out how to get it there). He told me that if they want it back when (if?) they reopen, they can have it. R.I.P. Dr Dremo’s…you will be missed.